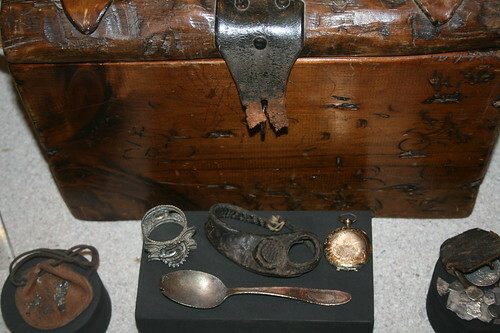 Wooden Chest and artifacts, originally uploaded by DianthusMoon. Recently seen at the Shipwreck Museum above Seashell City in Fenwick Island, DE (I have to go every year we are in that area). Anything displayed was pulled up from a shipwreck. It’s FREE to see. Had my second yard sale and it bombed! Only a handful of people stopped. ‘May’ try tomorrow. I only sold $14 worth of stuff. Last night my back tooth on the top left got a big chip in it. I was trying to avoid the dentist until January-oh well. It doesn’t hurt-it’s just a bit sharp. And our heater wouldn’t kick on yesterday, so we had a repairman here later and he said it needed a control box-probably got wet from all the rain. No one came today to install it and it’s chilly in here! I think it would be interesting to find a treasure full of goodies. Sorry to hear your yard-sale didn’t go well. I haven’t been to hardly any yard sale. With unemployment being 15% in my area what I notice Sunday evening or Monday morning they seem to be a larger donation in front of the thrift store. My guess there selling what they can before they leave but no one has any money. We were both thinking of shipwrecks this weekend! So sorry to hear the sale was a flop. Do you think the popularity of garage sales is going down? I know I no longer go to them, but that is because I have no room for more stuff. It used to be so much fun to find treasures.